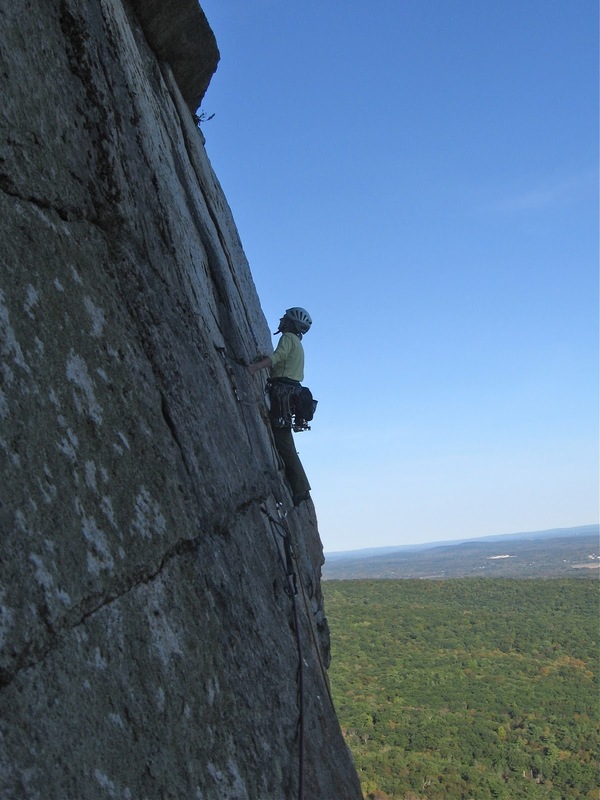 As implied in the previous Gunks post, the climb Cascading Crystal Kaleidoscope (better known as CCK) has a great photo op on the final pitch. Leaving the comfort of the big Updraft corner, you step gingerly down and across the clean face to join a vertical hand crack/flake that leads straight up under a huge roof area. While the CCK Direct route climbs up over these roof systems (at a much harder grade) the original line traverse right under the roof for some exciting exposure and balance moves. Annie took this pic of me on this pitch - you can see why it is such a great vantage point. I was thinking of starting a caption CONTEST for this one!